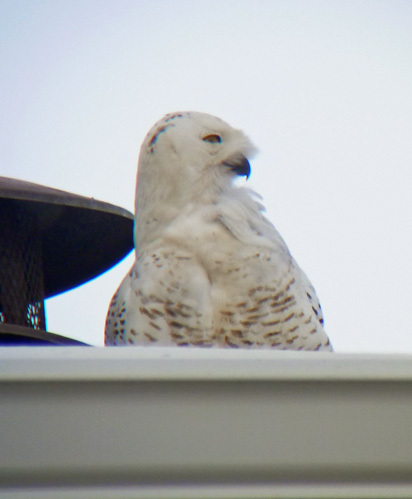 Well, a month ago when I missed seeing the Snowy Owl on St. Simon's Island, I jokingly told my friend Nicole that the owl needed to come to Tybee. Yesterday afternoon, she called me and said that my wish had been granted. 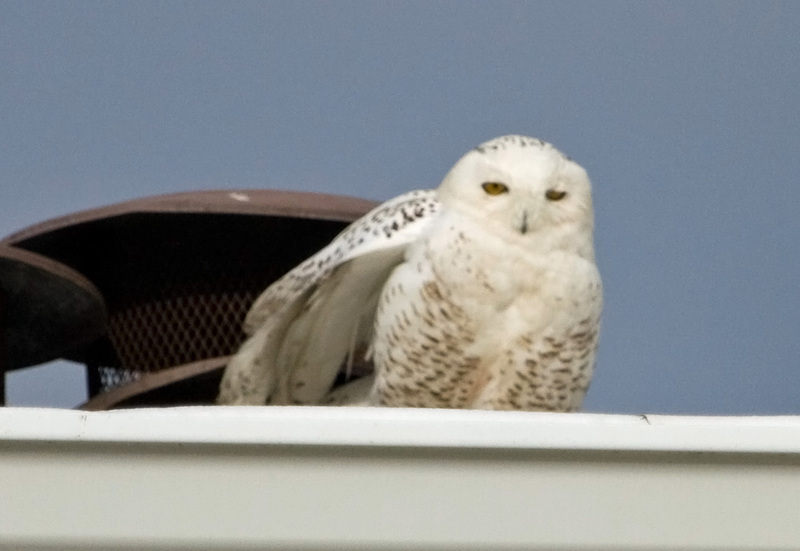 Tybee resident Julie Dillon looked off her 3rd floor balcony to the roof of the condo next door and saw a large white bird. 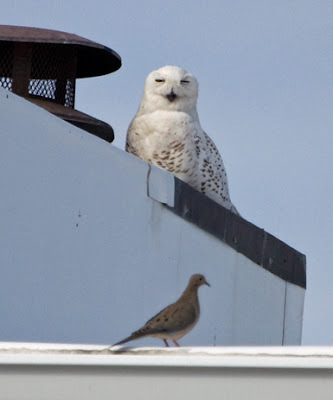 She checked on the internet and determined that it was a Snowy Owl. Julie attempted to reach me at home and at work. Unfortunately, I was in town for a presentation and couldn't rush back to see the owl. I went out first thing this morning and driving down Tybrisa, almost to the Pier, I glanced to my left to see a large white owl perched on a cupola of a condo. Before I could get my camera ready, it flew. When I parked and went to the front of the building, there was Mr. Snowy sitting on the edge. I took a quick photo in the near darkness. Then a Cooper's Hawk flew in and the next time I looked the owl was gone. Several other folks arrived and we searched in vain for more than an hour. Just when I was about to give up, we saw a large white shape fly towards us and land on the rooftop of Julie's condo. He sat there for several hours. What a day! What a bird! WOW!